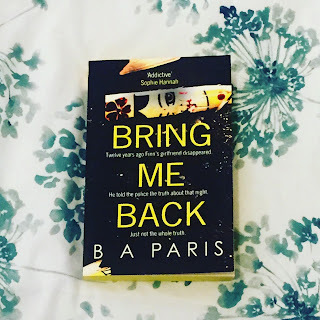 Bring Me Back is a brand new thriller from million-copy selling author B A Paris most well known for her best-selling debut Behind Closed Doors. Twelve years ago while on holiday in France Layla goes missing, leaving behind a tiny Russian doll. At the time Finn told the Police the truth, just not the whole truth. Now Finn is happy; he has a good job, a beautiful Fiancé, a house in the quiet village of Simonsbridge, he is happy. Until a series of tiny Russian Dolls start appearing which can mean only one thing – Layla is back! This book was exactly what I needed to shock me back to life after getting stuck in a reading slump at the end of January. I knew every quickly that I was going to love this book and from page one I was hooked. The book is made up of three parts, the majority of which are written in the first person narrative from Finn. This gives the illusion that the events are being recounted rather than experienced firsthand, almost like a Police interview, a technique that works well in conjunction with the alternative chapters that are portrayed as flashbacks. The two storylines running alongside each other is what kept me turning the page. The need to know what happened that night twelve years ago combined with the need to know if Layla really is back is an effective way of creating suspense and keeping the reader engaged. I really admired Paris’s choice to hint at mental illness through the choice of characters. Without giving away spoilers it becomes clear very early on that there are more than once voice in certain characters and it becomes much clearer as to who when you read the book. So read the book! Overall it took me less than 24 hours to read. I couldn’t put the book down and when I did all I kept thinking about was what was going to happen next and when could I go back to reading. I wouldn’t say it is one of my favourite reads this year, but something defiantly spoke to me and kept me reading which will forever work in its favour!